A collar is a very multifunctional item. Your pet can wear it nearly the whole day. 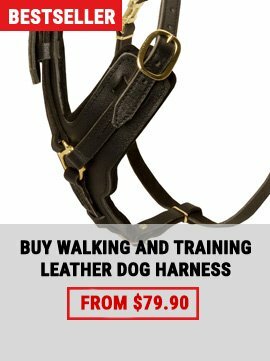 You use a collar for training, walking and sometimes even playing. 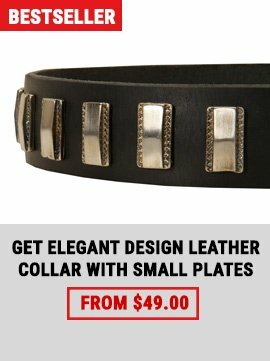 Don’t you think that it’s time to choose a good long-servicing collar? Handlers often forget about the reliability and functionality of the collar. That’s why they may buy a collar that does not suit their Bullmastiff at all. A collar should be easily adjusted to a dog’s skin. For this purpose we use specially selected leather, but not all collars are as good as they may seem. 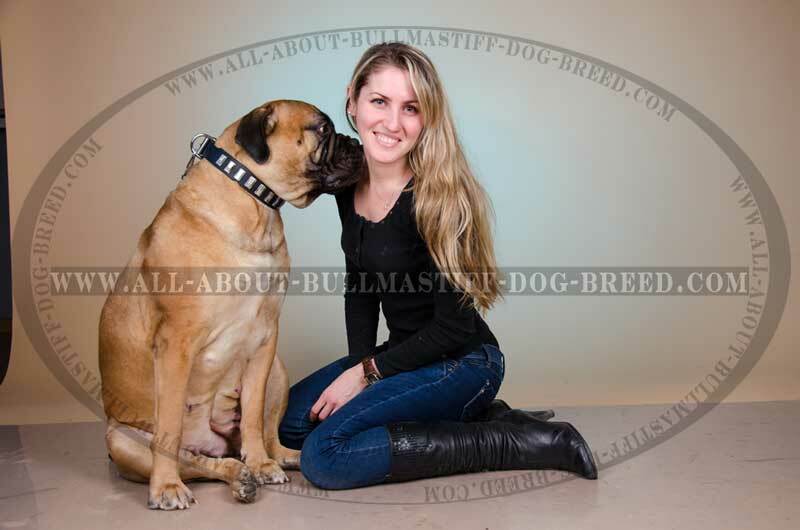 Do not be upset, because you happen to be in a store that is devoted to the Bullmastiff breed and today you are lucky to see the presentation of a new collar. 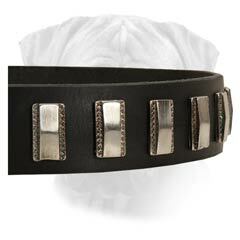 This is a Top Quality Super Fashionable Leather Bullmastiff Collar with Durable Hand-Set Nickel Plates. This collar has a lot of advantages, but we want to give you a chance to check everything yourself! A lot of customers have already checked how this collar works in reality and have made their choices. 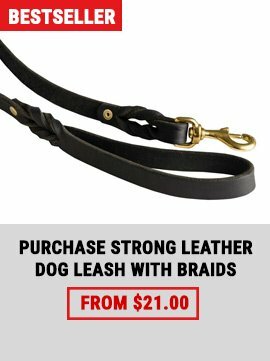 Now it’s your time to choose, but before you make conclusions, we want to share some information with you about this leather high quality super strong plated collar for Bullmastiffs! Safety. 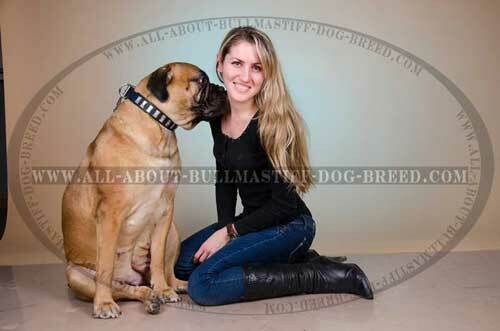 You may have heard that regular wearing of the collar may affect Bullmastiffs’ health. Do not worry because this will not happen if you choose this collar. We want to remind you that only the finest materials are used for the production of this item. Order the right collar and you will get rid of many problems! Handling. The first impression Bullmastiffs make on people is that they are aggressive. Bullmastiffs really can get excited spontaneously and you need to keep an eye on them in order to avoid unpleasant situations. For this purpose you will need a very strong and durable collar. We hope that we accomplished this assigment. This collar has been tested a lot of times and it did not break. We assure you that this item is recommended by professional trainers. 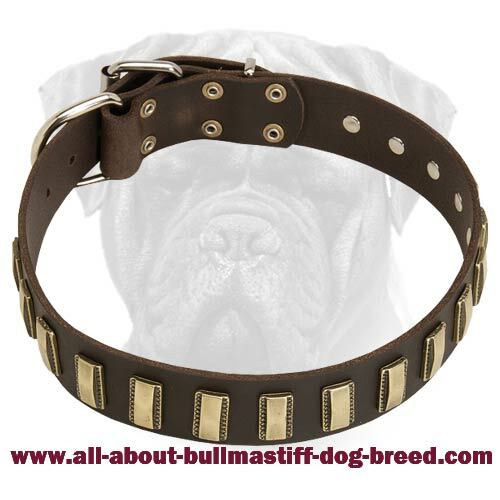 Purchase this collar and it will be easier for you to handle your Bullmastiff. Fashionable. 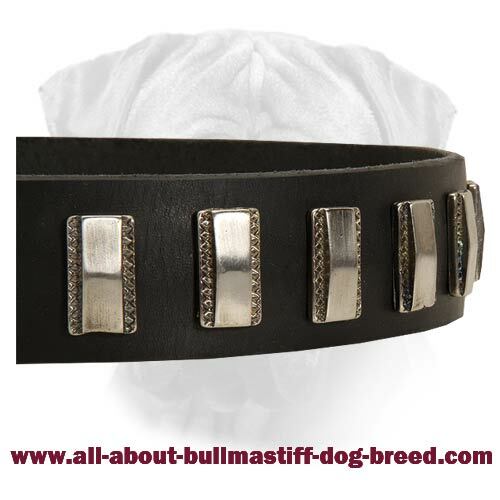 We want every collar to be unique because that will help to make the Bullmastiff look unique. 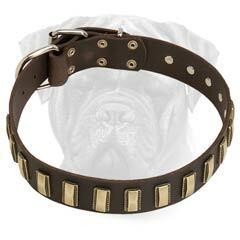 We decorated this collar with the help of rust resistant plates that are completely safe and will not fall of on the spur of the moment because they are hand-set.